The Beachouse i Coral Coast, Fiji: Reservér nu! The resort caters for both global travellers and local holiday makers, fostering a more authentic Fijian experience than offered by the larger resorts. The Beachouse is the perfect home base to explore breathtaking canyons of the Upper Navua Gorge, mountainous treks to gushing waterfalls, world class diving and more. Enjoy an early morning surf on the break in front of the resort or for those lazy days, just chill out in a hammock by the pool! 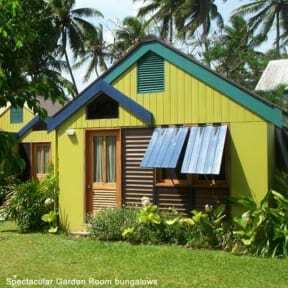 The Beachouse offers stylish bungalow accommodation for couples or families and tasteful 6 bed dorms for the seasoned traveller, attracting adventurous nomads of all ages from around the globe. The menu features the flavours of Fiji with a focus on fresh fruit, vegetables and spices.